1) Log in to Vyond Studio and click the account dropdown tab (the initial or letter may look different). 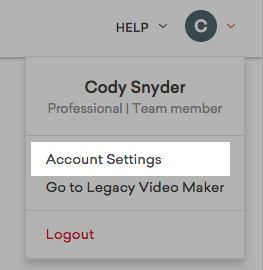 3) Select a tab and make changes to the account. Save any changes before navigating away from the page. Please note: these tabs will vary depending on the permission level for the account. For example, Admins may have the ability to invite others to join the account, or a page to set up password & security standards, while regular accounts look like the screenshot below. Click here for more information about payment methods.